It was so nice taking a quick little break from blogging. I believe I mentioned in my last post that during my time away I accumulated quite a back log of nails to post! All the pictures are edited and they are sitting as drafts on blogger....only thing that is missing is the writing! So here I am tonight in the midst of a mini panic attack writing out a blog post. Panic attack you say? Well I'm in the midst of working on a graduate project, and for those of you who have been there, you know what I'm going through. It is December, meaning, it's time for some Christmas nails! My list of ideas keeps growing for Christmas manicures, and with my every three day painting routine (which I will not be giving up since it is a huge stress reliever), I am sure I will get through all of them. 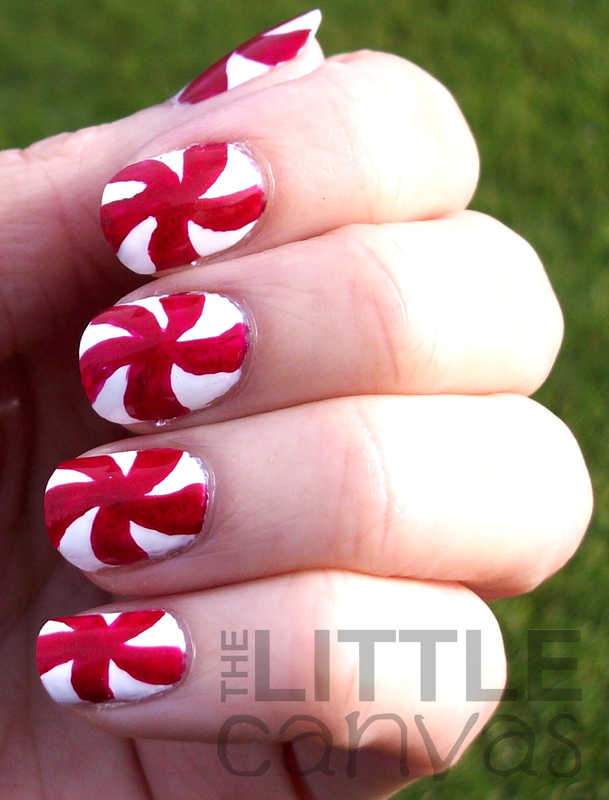 For my first design of the season, I wanted to do peppermint candies. You know, those little red and white swirl candies that sit in bowls at doctors offices. In my surprise Julep December Box, one of those candies came, so when I saw that, I knew it was the perfect time to paint them on my nails. Enough of my babbling, let's take a look! I didn't take as many pictures as I normally do because well, at every angle these nails look exactly the same. Not much detail, and after seeing other bloggers freaking out over the Blogger picture limit, I figure I might as well save space where I can. Can I tell you how many compliments I received on these nails? At work, customers were asking if they were the Sally Hansen stickers or which salon I got them done at. I have to say, the look on people's faces when I say "I did them myself" is probably one of my favorites. Some people have stopped dead and grabbed my hand saying "No way!" It's comical to me, and well rather flattering. On Instagram, someone asked me if I had used tape to accomplish this. Many of you know how much I dislike tape manicures. Not due to how they look in the end, they look awesome, but because I fail at them. No matter how long I let the polish dry, and how much of the stickiness I remove from the tape, the polish still rips off. It's frustrating, and well, I rather not use it. These nails were rather simple. After painting on two coats of Snow Me White, I took one of my nail art brushes and started to trace the swirl pattern with Red Carpet. Once my outlines were completed, with the brush I filled in each little section. Added some Out the Door and was done! For those of you who do not own Red Carpet, you need to go out and find a bottle. This is by far one of my favorite red polishes. It is kind of jelly consistency, but more opaque. Within the red polish are very fine red glitters...it's so pretty. What do you think? Love, hate? Have you attempted swirled nails before? I will be doing this design again in the future with different colors. It was so quick and left me with a really cute and fun manicure. 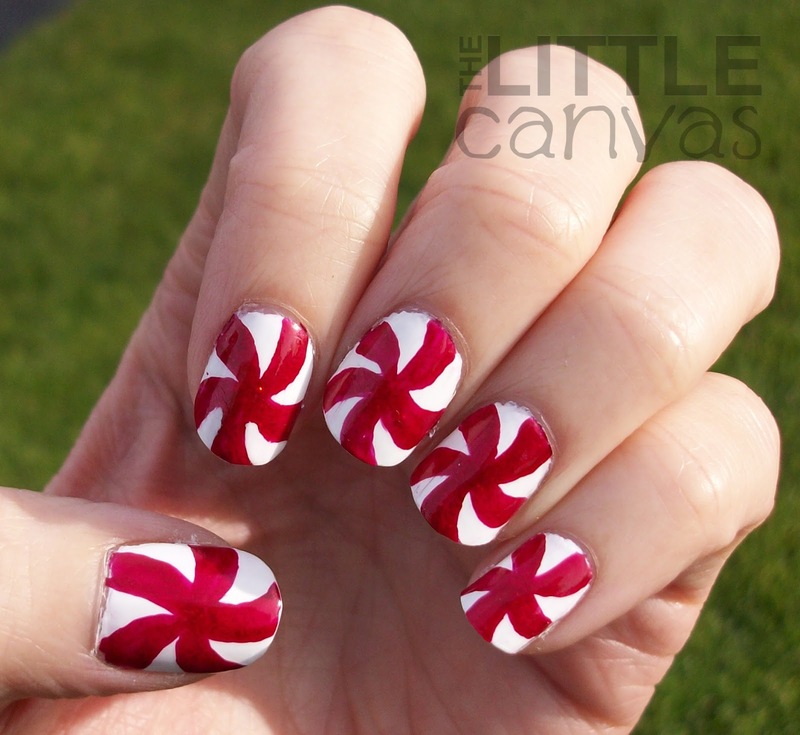 Now after staring at these pictures while writing the post, I want to do my candy cane design. I believe today is a nail painting day, so maybe I will....hmmmmm. Why did ya have to go and make a candy themed day in the challenge ;DD I just love all of it!! I'm not doing the challenge anymore! I gave up because I was burned out *hangs head* But it's okay because now I can spam you all with Christmas manicures up until the 25th! Wow! I really like that! Looks easy to do (good for me) and very nice effect! In fact I'm new to this and my blog is all about my first attempts, trying to find some hobby companions and more expert to advice me and help me improve. I will totally try this look and hope you'll join me on my blog, where I also talk about other stuff. Thanks!!!!! Welcome to blogging! hope you enjoy it as much as I do!